The Yamaguchi esterification is an organic reaction used to convert a carboxylic acid and an alcohol to an ester using triethylamine, the Yamaguchi reagent, and DMAP. The mechanism begins with deprotonation of the carboxylic acid by Et3N to form a carboxylate anion which then attacks the Yamaguchi reagent. 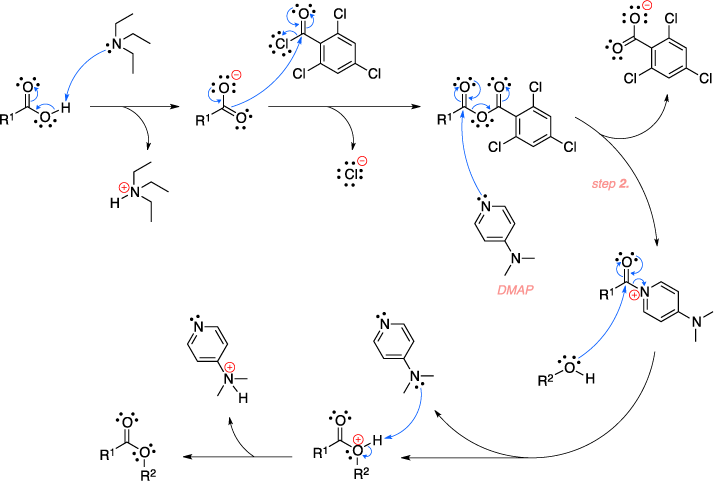 The resultant acid anhydride get attacked by DMAP to form a better leaving group which is then displaced by the alcohol reagent. A final deprotonation step results in the ester product. Inanaga, J.; Hirata, K.; Saeki, H.; Katsuki, T.; Yamaguchi, M. Bull. Chem. Soc. Jpn. 1979, 52, 1989–1993.